With the wind blowing and sun peaking over the bluff, my guide navigated the protruding shelf on the main lake point. The thump I felt on my rod was unmistakable as we hit the drop off. A minute later I had a keeper walleye in the boat. In a few hours, we ended up wit seven toothy critters, including two 5-pound tanks. Luke Jarman and his dad Les have been guiding on Stockton Lake for over 40 years. “I have fished every part of this lake, and it can be feast or famine, but usually in September fishing is great,” Luke said on a recent trip. 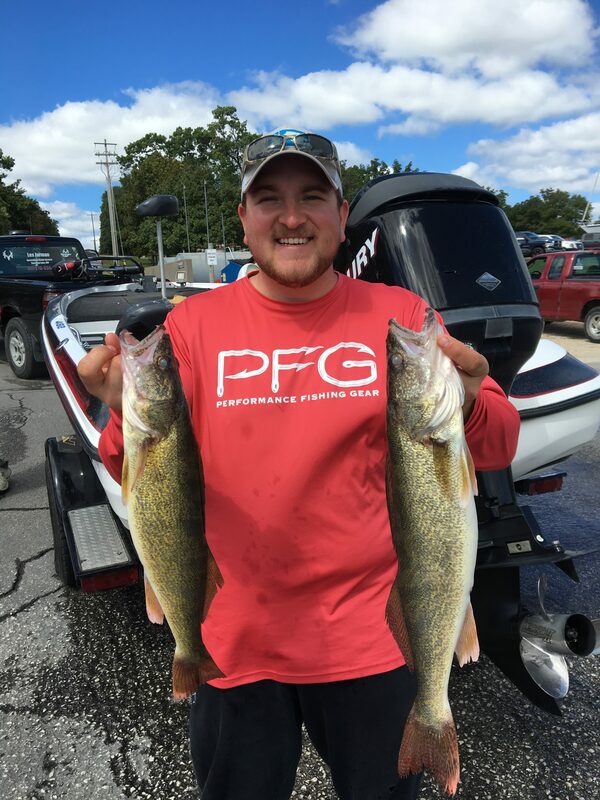 September is a good transition time for many animals, and walleye are no exception. They are feeding voraciously and easy to find. Although you can target the big ‘eyes a few different ways, our main tactic was trolling crankbaits. “Predatory fish follow the shad, and the shad hang out on main lake and secondary points this time of year,” Jarman stated. They key is to find what depth the fish are holding. Once we found the depth, the catching was great. The author with two stud, Stockton Lake Walleye. Depending on the depth, you will have to adjust the type of crankbait you are trolling. We were targeting walleyes in 8-12 feet of water. For this, we used Bandit 100 crankbaits. With a straight retrieve, they will go 5 to 6-feet, but when trolled they get right near the bottom. Any color that looks like a shad works great. For fish holding deeper, throw a number five or seven Flicker Shad. For trolling these baits, a 6’6″ or 7′ medium or medium heavy rod is necessary. A reel spooled with 8 or 10-pound test is recommended. Les and Luke Jarman with a mixed bag from Stockton last weekend. With the concentration of shad in September, you can bet on catching a variety of fish on the points. 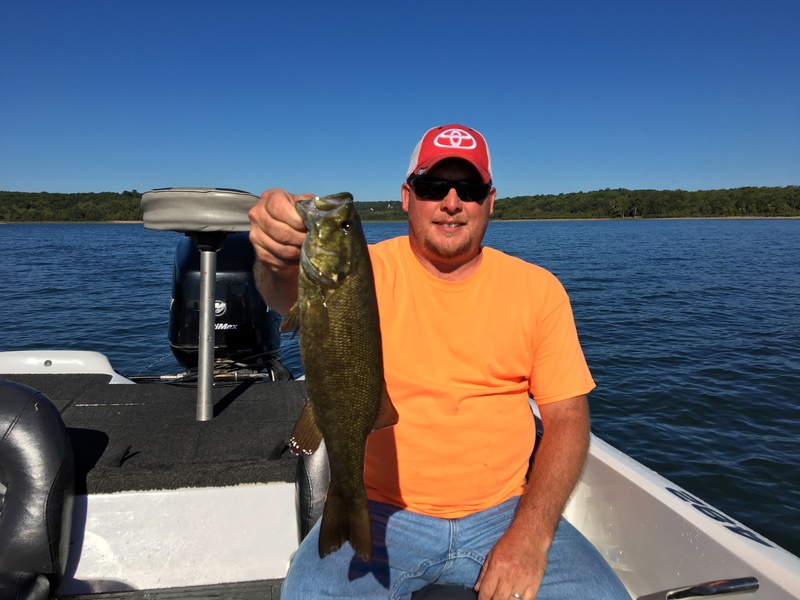 We boated six different species, including smallmouth, spotted, and largemouth bass, channel catfish, walleye, crappie and white bass. When you troll, you never know what will bite! A bonus 16-inch smallie while trolling. When a big walleye hits, it is hard to mistake. They stay deep and pull hard. Fishing for these coveted fish only gets better as the calendar rolls on, but in mid-September you can bet trolling will put a limit in the boat. To book a trip with Les or Luke, visit their website or call 417-276-5568. 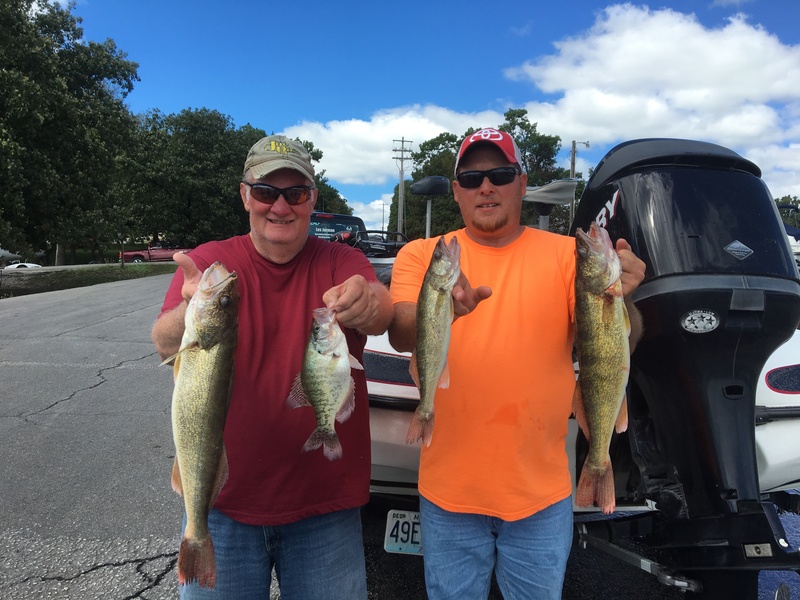 Luke Jarman, Mahoney Outdoors, Missouri Walleye, Ryan Miloshewski, Southwest Missouri lakes, Stockton Lake, Walleye Fishing. Bookmark.